Earlier this decade, Peter Kaldor and Rod Bullpitt wrote Burnout in Church Leaders (Adelaide: Openbook Publishers, 2001), The book drew upon, and sought to collate and comment upon, Australian findings gathered in the 1996 National Church Life Survey (the NCLS was completed by around 4,400 senior ministers/pastors/priests in around 25 denominations) and the then-named Catholic Church Life Survey (the 1996 CCLS sampled 256 parish priest and 97 assistant parish priests). They record that while variations in levels of burnout exist, burnout is ‘clearly a significant issue for the churches at large’. They noted that higher than average burnout scores were recorded for church leaders serving in Anglican, Reformed, Lutheran, Presbyterian, Church of the Nazarene, Roman Catholic and the Salvation Army; and that there were (surprisingly) lower than average burnout scores among Pentecostal denominations, and some smaller denominations, including the Wesleyan and Brethren churches. They note: ‘Such a result may surprise some, given the high stress that can be associated with large and growing churches, which are more common in the Pentecostal denominations. This is where a distinction between positive and negative stress may be important. The pressures of work in congregations that feel they are going somewhere may generate stress that is positive and energising, rather than negative and leading to burnout’ (p. 13). 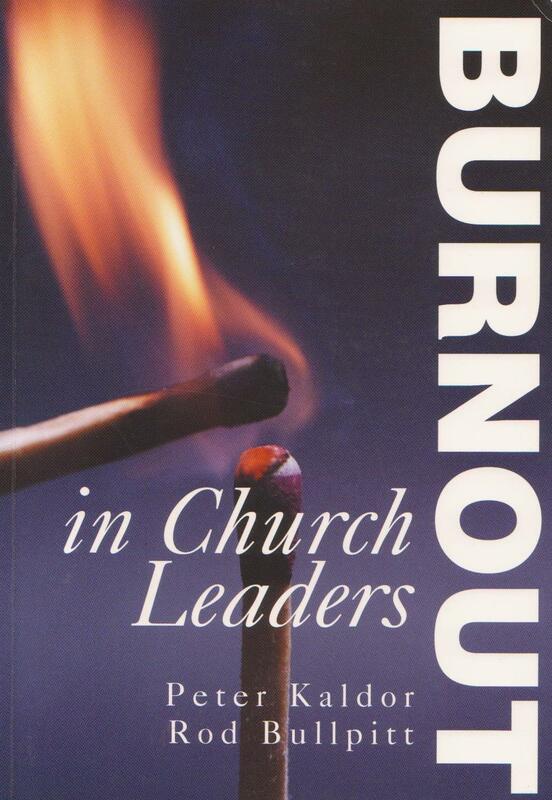 They also note that younger leaders are more susceptible to burnout (p. 13), and that it is, apparently, ‘more stressful to be a charismatic minister in a non-Pentecostal denomination that it is to a pastor in a Pentecostal denomination’ (p. 16). Kaldor and Bullpitt also highlight that while one may raise some questions about the applicability of the Alban Institute classification for the Australian context, the results are confirmed by other questions in the NCLS. Around 11% of Protestant/Pentecostal church leaders and 9% of Roman Catholic leaders agree or strongly agree that they often do not feel they are the right person for the job in their particular congregation or parish. Such people have significantly higher levels of burnout, scoring around 50 on the AIBI, compared to an average of 38, placing them firmly at the high burnout end of the spectrum. Moreover, something in the order of 12% of Protestant leaders and 8% of Roman Catholic leaders say they ‘often’ think of leaving the ministry and an identical percentage (12%) from both groups diagnose themselves as having high or very high levels of stress. The results of the survey show that more clergy place themselves at the high end of the stress scale than at the low end, and that clergy recognise in themselves the seeds of a problem. ‘It would seem that a significant number of senior ministers/pastors/priests in Anglican and Protestant congregations in Australia are suffering severe burnout and are at risk of leaving the ministry. The figures from Catholic priests participating in the CCLS suggest similar levels of burnout to their non-Catholic counterparts. These results may well constitute the tip of the iceberg for the churches in this country. It is quite likely that they understate levels of burnout. There is always some measure of error in self-reporting, and clergy may underestimate their levels of stress out of a desire to be seen (to others or to themselves) as competent in their roles. This is certainly the perception of those who are responsible for caring for church leaders. In addition, these results are for people currently exercising senior leadership within congregations and parishes across Australia. It does not include those who are no longer in congregational/parish ministry, fulfilling other tasks in the churches or working in quite different fields. It does not include the many people who have moved out of full-time ministry altogether, possibly as a result of burnout. Could the causes of burnout be more extensively hidden than we imagine? Consider the rising tide of atheism, agnosticism, evolution as basically replacing the Bible as the explanation of origins, the growing inimical attitude of society toward the Christian Faith as the hidden rulers prepare to establish a world government sans the Biblical Faith, the influence of microwave radiation designed to create stress, electro-magnetic effects by our electrified civilization, pollution (chemical, electrical, acoustical, environmental, etc. ), and a host of other factors. Remember C.S. Lewis presented the conspirators as succeeding in thei desire to control and program people to do what they wanted until Ransom said, “They pull down deep Heaven upon themselves,” a good description of a Great Awakening and the answer to our growing perplexities. A thought about the findings w/ Pentecostal pastors and burnout. Pentecostal spirituality, at its best, concerns itself with the formation of Kingdom affections(see Steven Land’s A Passion for the Kingdom); I wonder if this might explain the greater resistance to burnout? Esp. of interest to us as we call a new minister at the end of the year. How can we as a parish best support him and his family? Who has a couple of creative ideas they can share with us? Our minister has been with us six months now. At the commencement of his ministry he told us he’d “learn to love us”. I thought at the time “how do you learn to love?” But we are learning, it’s a mutual thing. One of our wardens is the “minister’s warden” and we have a safe ministry person (retired school counsellor/psychologist) who is very active with both minister and congregation.